and Kimiko is officially full term. It’s really difficult to walk now without Kim’s help — getting up from bed or even from a sitting down position is somewhat an ordeal what with gravity working against me and my basketball of a tummy. All of the pregnancy sites and books I’ve made a habit of visiting and consulting state that from here on end it’s all a waiting game, at least for the next three weeks. Am very relieved that Kimiko’s now fully formed and her lungs are now functioning well enough to allow her to breathe normally if she were born today. After last month’s scare when I had those contractions, well, you can just imagine. I haven’t written in a bit, but I have had so many things to write about in the last week or so. On a personal level, I’ve become addicted to Ebay.ph and bought Kimiko’s equipment off the net (am proud to say that we’ve gotten very good bargains. I’ve had to be very patient monitoring the items I bid on because, well, somebody else might’ve won hadn’t I kept an eye on them. Had no choice really as Kim and I can’t afford to buy stuff from the malls because they’re about 30% more expensive ) Also, thanks to good friends like Nova and Jang who unloaded the clothes their babies have outgrown, I haven’t had to buy onesies, blankies, etc. Hard to believe because am much taller than her, but since February I’ve been wearing some of Nova’s maternity clothes. Ka Ricky and his wife also gave me a new set of baby bottles and sterilizer. It’s funny how through the last few months I’ve become fluent in this new language – the ones mothers and mothers-to-be use when discussing their respective pregnancies and gestational experiences. Discussing various brands of diapers; the pros and cons of using BPA-free plastic feeding bottles versus glass bottles; whether Fisher Price or Baby Einstein toys are safe because despite being American design in origin, they’re manufactured in China where lead is supposed to be one of the major ingredients of most products. Bassinets, cradles, Moses baskets, carriers and slings. Nursing pads and breast pumps. Foldable baby bath tubs, hypo-allergenic towels. Did you know that for at least the first month, newborns can mostly discern (80%) only the left side of the world (they’re Leftists so early on, haha!) and they are fascinated by their own image in the mirror? They also like black and white images during the first month. 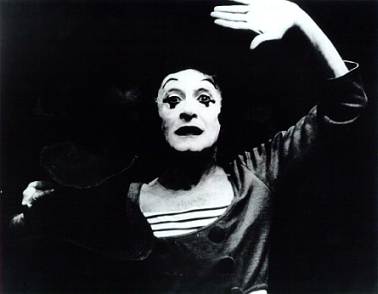 I told Kim he has to dress up like Marcel Marceau’s Bip when he talks and plays with the baby. Or one of those characters in a Jean Cocteau film that emerge from crooked doors and slanted windows glued to pale walls with pealing paint and wallpaper. It’s an altogether different world, one I really never seriously thought I’d become part of. It’s happy and worrisome and awe-inspiring and scary all at once. Kim and I debate and argue over so many little details about birthing techniques and whether swaddles work or what kind of music to put on and SIDS. While I’m desperately focused on giving birth and ensuring that Kimiko gets a good AGPAR score, Kim is already preparing a syllabus on calculus, biology, and atheism for her. The only thing that Kim and I seem to agree on is Kimiko’s wardrobe: she is not going to be kikay: ibili ko na daw ng maong, plain white shirts saka sneakers. It’s been so painful reading the news the last week. The agonies, tragedies and deaths caused by typhoon Frank are the stuff of waking nightmares. The only thing that keeps me from getting all teary (pregnant women cry easily, I can tell you that) all the time is the anger and outrage I also feel over Macapagal-Arroyo’s trip to the US. Isaksak mo sa baga mo ang pekeng simpatiya mo, you witch! The least she could’ve done is come home and made the rounds to the devastated areas and promised that ALL of her salary and financial benefits and perks will be given to the victims/survivors and their families and for the rehabilitation of the provinces severely battered by the typhoon. Instead, gad, there she stayed and continues to stay in Washington DC feigning deep concern for the victims and pretending to be on top of the situation. The she goes ahead and crows about how the Philippines is the US’ staunchest, closest ally. Holy heck, it’s more than enough to make me throw up, nevermind that I’m past the throwing up phase of my pregnancy. It’s so surreal how Macapagal-Arroyo has the gall to pretend that she is all worried about the plight of the survivors of the doomed Sulpicio Lines ship and the other victims of typhoon Frank. I think she actually couldn’t care less and might even be glad that the tragedy has brought international attention yet again to the Philippines (this time as a worthy recipient of global concern and sympathy — hey, even Pope Benedict and Dutch Queen Beatrix have said that they’re praying for the Filipino nation). Genuine compassion is simply not in Macapagal-Arroyo: I think she’s completely incapable of true humanity and empathy because she is always focused on herself and her thirst for more and more power and control. ‘The news reports also state how many congressmen joined the junket. Ang kakapal talaga ng mukha, spending taxpayers’ money on a trip that will in no way contribute to the betterment of their constituencies. I don’t buy Speaker Prospero Nograles’ argument that the congressmen and women’s participation in the presidential visit is no big deal so long as they spend their own money. For starters, who the hell believes that these officials are spending their own money? And another thing, isn’t it the height of callousness that they should leave their posts just so they can ingratiate themselves further with the corrupt presidency, leaving behind their constituents drowning in the flood waters or buried under landslides or collapsed infrastructure? Wala na ba silang ibang magawa? Why don’t they freaking rack their collective puny brains and figure out a way to bring down the price of rice, electricity and water rates?! Aaaaargh! Now they’re all gonna come home with carrier bags from Macy’s, Nordstrom or Barney’s na puno ng tsokolate, pabango at damit, and you can just bet that these won’t be part of donations for the victims. Happy news that I didn’t get to write about last week: Jo and Jordan have gotten married! Reception was last Sunday at the Balay Kalinaw in UP Diliman. Jo was so beautiful, a blooming bride despite having stomach flu; and Jordan was his boyish self, but manly in his barong. Jo’s dad, UP Prof. Doti Abaya was so proud, and so were Jo’s mom Robin and Jordan’s parents. It was a happy, happy event (but Kim and I had to leave right after dinner because my back was killing me). The invitations were so like Jo and Jordan (to whom I will always be grateful because at my own make-shift, self-catered reception three years ago, they slaved over the charcoal grill and cooked talong and tilapia) – creative, sincere. I promised myself that after the last series of entries, I would come up with more cheerful ones. In the past week I’ve been planning and buying clothes and other stuff for Kimiko (five more weeks to go!) and wasting time on the internet looking for Moses baskets and breastfeeding cloths and surfing sites on how to deal with the pain of childbirth (it helps to be informed — I don’t mind admitting that AM FREAKING FREAKED about labor pains, but the more I learn about how to handle it, the more confident I feel). least not for very long. Of course am agitated and majorly ticked off my the economic issues of the day. Rice prices continue to rise, along with the price of gasoline, and its appalling how the government continues to spout lies about how it’s actually on top of the situation (yeah right! Someone please make Gloria Arroyo stand in line for NFA rice sans bodyguards, sans umbrella, and definitely sans special treatment) while hundreds and thousands of Filipino start feeling really desperate that soon enough, they won’t be able to buy rice at all because (1) it’s too expensive; (2) it’s too difficult to get. There are reports that in Mindanao, rice is being sold at P60 a kilo. The Commonwealth gas stations are selling diesel at P55 a liter. How the hell are people supposed to cope with these increases when their wages remain pegged to the floor, with the real values steadily decreasing?! It’s unreal — a week ago I read a news story about a padre de familia who committed suicide after failing to buy rice. The wife said that her husband’s desperation over the high costs of living probably reached its threshold and he couldn’t cope anymore so he opted out by way of hanging himself. As for the Meralco Wars, sheesh, like anything good will come out of Winston Garcia supposed pro-consumer posturing. He’s as corrupt as Macapagal-Arroyo and he’s manipulated the GSIS funds like they were his own money, at the expense of GSIS members and pensioners. Kung matino ang gobyerno, isasabansa ang Meralco, ang Napocor at ang mga IPPs and rates will be regulated. No more profiteering, but all operations will be service-oriented. Scrap EPIRA, overhaul the ERC, and confiscate Meralco from the Lopezes. The issue about senators appearing in commercial ads was also interesting. I don’t see any problem with officials appearing in tv ads per se- but only if the messages have real relevance to Filipino’s economic lives and can contribute to their general well-being. Ads like how Pinoys should stand up against government corruption; against extrajudicial killings; against high prices and rates of social services. But certainly not to endorse products like cigarettes or alcohol; to just come out selling themselves like they’re God’s gift of relief to the long-suffering Filipino people. I am particularly disgusted with the Lucida DS glutathione ad billboards featuring Loren Legarda. Gad – what kind of message is she sending – kailangang magpaputi ang kababaihang Pilipino?! She’s so freaking vain; but what’s more glaring is how pathetic and desperate she is to call attention to herself to extent that she’s endorsed a whitening pill. So much for being proud of being a Filipina — she’s encouraging Pinays to whiten their skin and look Caucasian or at least Japanese. Actually, it’s been a while since I last thought the word ‘credible’ applied to Legarda. It’s clear from all the careful and/or crowd pleasing/wishy-washy-weak stands she’s been taking on crucial issues political and economic that she’s just binding her time until 2010. Sure enough the other day there was a newsreport of her announcing her intent to run for president in 2010. Ugh. The thing I’m most upset about, though, is about the reports that some 30 plus babies have died because of neonatal sepsis after being born or confined at the Ospital ng Makati. This story depresses and worries the hell out of me. Imagine losing that many babies! Just one baby dying of a disease caused by carelessness is insane! When the story first broke out I quickly looked up medical journals on neonatal sepsis, and gad, it’s so easy to detect and avoid. Prenatal check-ups and closely monitoring the mothers’ health; and making sure that the hospital nurseries and operating room are completely clean and sterile (the same goes for the homes and rooms where the baby will stay when he/she’s been brought home already). I go nuts just thinking about baby diseases. I’m 35 weeks gone and have 5 weeks to go before Kimiko pops out (hopefully without much pain and anguish on either our parts, but am willing to suffer more pain if it means that she’ll be okay), and it’s lunatic to risk losing her to a bacterial blood infection (or losing her, period) after all that she and I have been through these last almost-nine months. Right now she’s kicking and wriggling and moving about, and despite the level of discomfort and, sometimes, even pain I experience when she kicks or punches particularly hard, am very relieved and happy to feel her. I feel like buying liters of cleaning fluid and scrubbing down the entire house and then spearheading a campaign for the full fumigation and sterilization of all infant care wards and birthing rooms/centers. Gad. Oh to live in Cuba where there’s a doctor for every neighborhood block! Libre ang regular prenatal check ups and even caesarian operations. Bigget budgetary allocation go towards public health care. Hay. Dito sa Pilipinas, may polio pa rin, may mumps pa rin, may TB pa rin, may dengue. Aaaargh! Sukatan talaga ng pagiging mahusay, makatarungan at maka-mamamayan ng isang gobyerno ang kakayananan nitong bantayan, alagaan at paunlarin ang kalusugan ng taumbayan. The public hospital and health care system in the Philippines drives one to tears. This just in – posted at GMANews.TV: Pessimism among Filipinos growing. Does this reflect my current state of mind right this moment or what? Personal outlooks on the quality of life have fallen to a neutral level and expectations about the economy are now even more negative, a new Social Weather Stations (SWS) survey showed. The independent pollster’s first-quarter social weather survey, made exclusive to BusinessWorld, found 29% of Filipinos optimistic about their personal quality of life — barely changed from 30% — and another 23% pessimistic that it would get worse, a plunge from 16% previously. The rest said they expected no change. Well, I expect change. I demand it, and am willing to work for it, so I guess I’m not all that pessimistic.